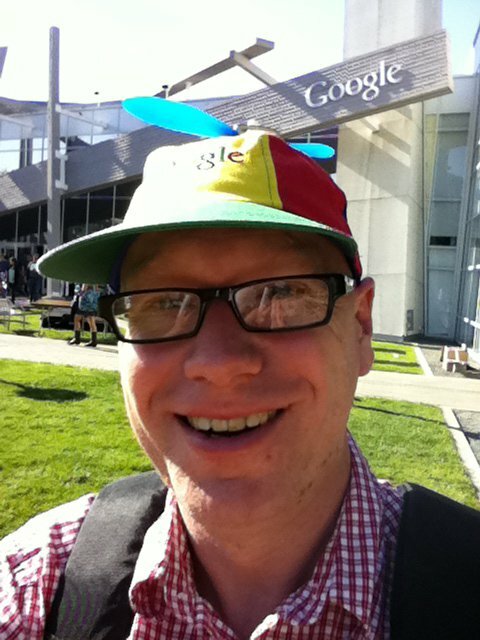 John Orr outside Google headquarters. Two years ago, mathematics professor and vice chair John Orr left the UNL campus for the Google campus. While he greatly misses the Lincoln bike trails and coffee shops, this campus on the San Francisco Bay provides a much different view. The Google campus in Mountain View, Calif., resides next to a park and nature preserve on the shore of the Bay. There also are restaurants all over campus and well-stocked kitchens in all of the buildings. But, working at Google is about much more than just the abundance of good food and a great location. "Google has an extraordinarily good work environment," Orr said. "Google is packed full of extremely smart people who are passionate about what they are doing and are eager to share ideas. On one hand everyone is extremely smart; on the other they’re busy doing stuff that’s never been done before. So everyone is willing to listen to new ideas or ask questions." As a senior software engineer, Orr recently has been developing Course Builder, an open-source tool for creating and running Massive Open Online Courses (MOOCs). Course Builder’s goal is to promote improved access to high quality education through open platforms. "It’s used by universities around the world, and also by other institutions wanting to offer courses, including Google itself, which has run courses on Web Accessibility, YouTube, and advanced search," Orr said. "Google also has recently partnered with edX, and our team is working with edX on open platforms to enable any academic institution, business and individual to create and host online courses." Orr has contributed to Course Builder by creating authoring tools for instructors to build their courses online; developing an extensible component model to enable embedding widgets, such as videos, documents, and questions, in lessons; and enhanced security and reliability. The platform powers more than 100 courses offered by Google and external partners such as Harvard, National Geographic, The Saylor Foundation and Stanford University. From 2011 to early 2013, Orr worked on the GeoCommerce/Payments team, where he developed the server-side architecture for receiving Google Wallet payments from a browser, which is used by Google Play, YouTube, and Google Drive, as well as external merchants. Orr currently works with a small team of just four engineers, but his last team consisted of 12. The organization of the engineering teams is very flat, with people contributing wherever they can. Google also places an emphasis on student internships, and Orr has worked with interns on both of his teams. "With Course Builder, it was particularly useful to have current undergraduates working on the team, and both of our summer interns contributed important features to the product," Orr said. "Google student internships are a great opportunity to be part of the company. If you saw the movie 'Internship,' the great food and the cool environment were real – the artificial and arbitrary competition was fantasy. In reality, engineering interns are integrated right into teams and work side-by-side with full-time team members, often developing features which are launched in Google products." The opportunity to be a part of so many different new products is definitely a draw for Orr. "I love what I’m doing right now, but almost every other team at Google is doing stuff that’s so cool I’d love to be part of it too," Orr said. "People do move around between teams quite a lot, probably for this reason, so I’ll likely be doing something different soon enough." While the cost of living has been tough to get used to, Orr said the California weather has more than made up for it: "I like to say, housing is really expensive but it comes with an awesome snow-removal service!"